Th-INK-ing of You: Just Because I Care! I created this card for a couple challenges on SCS. One was the Clean and Simple Challenge to use scallops on your CAS card, and one was the Technique Lover's Challenge to revisit an old technique of water coloring on kraft. We were to emboss an image on kraft paper in white, then water color it as is, or use white craft ink or paint on the image, and then water color over that. I used just white craft ink on my stem and leaves, let it dry and water colored it lightly, but the flower, I embossed in white, then painted it with white acrylic paint. When that dried I used SU! inks to color it, using an aqua pen. I popped up the image but kept the card CAS to fit the rules. I'm still struggling with clean and simple, but I am challenging myself to conquer the fear and keep trying!!! The image is from SU! Fabulous Florets, and the sentiment is from SU! Best Yet set. It was fun to get out some stamps I have not touched in ages and play! Today is my birthday and I had been sick yesterday, so didn't feel up to anything too taxing today... but this was just for fun. Wow!! Thank you for explaining how you did that, Grace!! The flower looks like porcelain. I am not kidding! The whole card is so warm and elegant!...and shows less is more!! Grace this is stunning - I love the drama of the white and rich colour against the Kraft! Sorry to hear that you have not been well, but great to hear you are now feeling better - you must have been to create this masterpiece! And yes, my week has started off beautifully with some Blog Candy arriving to bless me! This is stunning Grace!. The flower is colored beautifully. Grace, what a beauty this is! I'd say you're aceing the CAS....so sorry you are sick. Hope you feel better soon and btw, Happy Birthday! This is gorgeous my friend!! 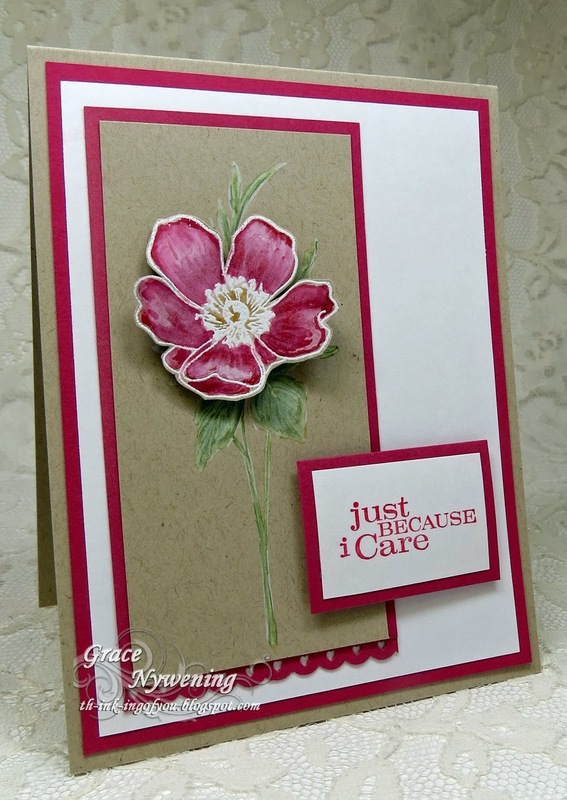 I just love the CAS design and your stamping on kraft!! Beautifully colored!! Oh, Grace, this is beautiful! I just love this CAS design, and your coloring on the kraft is beautiful! I was tempted...may still try...you've inspired me, sweet friend! This is so lovely Grace!